Held on 13 July in partnership with the GFT, the symposium brought together leading lights who are championing the D/deaf community today. Speakers came from diverse areas including the Scottish creative sector, LGBTQ+ community, D/deaf charities and more. There are about a million people in Scotland living with some form of hearing loss, of which around 355,000 describe themselves as deaf or deafened. So developing an inclusive approach to D/deaf arts consumers is a step that cultural organisations need to take if they are to cater to their audience. 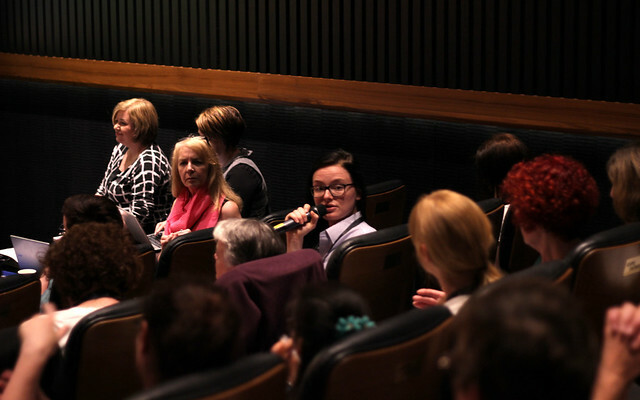 Through presentations, video and discussion, we brought to life real case studies, stories and best practice, all to show how the creative sector can be more fully inclusive of the D/deaf community. It was a highly participatory session with a lively discussion. This summary will give you just a flavour of the day by pulling out some of the key points participants raised. Click here for a full transcript. It's our duty as an independent cinema to respond to social evolution. If we don't provide events that resonate with or challenge our audiences, then we are not doing our job properly. Mark Stevenson from the Royal Conservatoire Scotland was among the contributors. He summed things up perfectly, stating that D/deaf people are the experts of their own experience, so any learning process has to be two-way. Janis McDonald, from the Scottish Council on Deafness, flagged that your audience base includes 20% with hearing loss. Our RCS video is live! She took this concept further highlighting some issues which really resonated, including the fact that in the digital age many people have to buy tickets or deal with customer service over the phone so organisations need to make sure their systems can support D/deaf users. Karen Forbes, a qualified BSL Interpreter and Director of InkBlot Collective, brought our attention to a great success story, showing how BSL and subtitled marketing has opened up productions to between 50 and 70 deaf and hard of hearing people every night at Citizens Theatre. Chiming further with many people’s experiences, Rita McDade (a lecturer on FROM RCS BA Performance in BSL and English) made some important points about how labels can lead to a ‘tick box’ approach from institutions, which sadly ignores the diversity of people with hearing loss. Iain, a sign language interpreter, explained how this can be manifested through inconsistent approaches. As he put it, you might see one performance that is BSL interpreted, one that is captioned and one audio described performance, but why only one approach at a time? We are delighted that this event has been a resounding success – but the activity is not over. We are pushing for a change in practice and accessibility and want to promote this and it's in our hands to commit to this change. Over the coming days, Culture Republic will bring you more videos and content from the symposium. We’re holding a dedicated ‘First Wednesday’ seminar on being (more) accessible. We will also be holding a follow-up meeting for attendees and speakers to continue the conversation. Registered attendees will be contacted directly to invite them to this informal session. Janis’ point is fantastic, we are all human, and having that label is not right, one size does not fit all. Am I deaf? I’m Rita! I’m a mother, and my mum called me Rita, not Deaf! I have a name, I’m human.